Medianu i mineddong-na este na trongko yanggen esta amko'. An un atan i hagon-na, aridondo i punta-na yan kumaninifes para guatu gi i lugat ni' chechetton i hagon kontra i trongko. Potpot yan metgot i hagon siha. Meggai-na biahi na tunas i trongko mientra luma'la'la'. Ti gos taddong i kulot lassas trongko-na, kulang gai'inapaka', yan guaha lugat gi lassas trongko ni' homhom. Didok na kulot agaga' yan metgot i hayu-na este na trongko. Kulot apaka' i flores-na yan guaha amariyu gi i talo'. Gof maolek ini na trongko ma songge, lao ti gof ya-niha nu i Manchamoru put guaha metgot na paopao humuhuyong an un sosongge. Gof metgot i hayu-na este na trongko yan gof maolek muna'setbe an para un hatsa guma, lancho para otro siha na cho'cho' ni' un nisisita metgot na hayu. This is a medium sized tree as an adult. The leaves are rounded at the ends and narrows to a small width where it attaches itself to the branches of the tree. The leaves are thick and strong. The trunk of this tree usually grows straight. 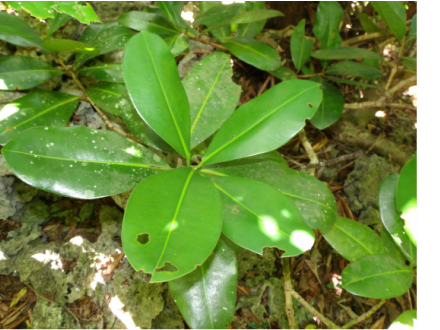 It has light bark with dark patches. The wood of this tree is dark red and strong. The flowers have white pedals with yellow stems coming from the center of the flower. The wood burns great, but is not a favorite amongst locals due to the smell that comes out as you burn the wood. The wood is strong and can be used for wooden structures or projects.